Tool Test - Norris A5 - How Well Do They Work? We don't typically publish tool tests or reviews but I see they are very popular blog material for other woodworking blogs - so here goes. 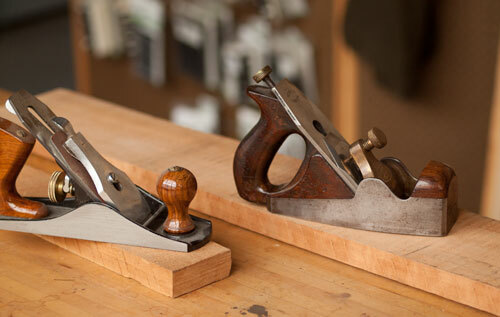 Question: How well will a mid-1930's Norris A5 Smooth Plane perform at smoothing a rough board? Test conditions: The plane was sharpened up and placed in the center of a rough 4/4 board of cherry. Cherry was selected for the test because it is a typical cabinetmaker's wood. Control: As a comparison a similarly sharpened Indian #4 with a heavy iron was placed in the center of a similar board. To make sure the test was fair and the boards were only planed by the planes in question the workshop was locked, and myself and my assistant helping me set up the test retired to another location for refreshment. After an hour we returned to see how much progress was made in getting the boards smooth, and also we wanted to examine planing flaws such as tearout and other surface defects. On entering the workshop we discovered that both boards were still exactly as how we left them, neither plane showed any progress on the boards. There wasn't a shaving in sight. This was very disappointing and nothing like the results other reviewers have reported. We debated but then decided to continue the test for several more hours. The workshop was again locked up and we retired to the pub. Returning two hours later we reentered the workshop and observed once again that there was no progress in smoothing the boards at all. Obviously with no success in smoothing the rough timber by either plane, trying to compare tearout was a moot point. In all fairness we thought there might be a problem with our particular A5. We therefore attempted to contact the manufacturer T. Norris & Son, of London but our efforts fell flat. We have heard rumor that they are no longer in business, which comes as no surprise considering our experience. Our conclusion: Neither plane works at all and you would be well advised to just get the less expensive Indian(around $35.00 at some retailers plus the cost of a heavy blade) than the Norris A5 ( 47/6 at Buck & Ryan) if available. Note: we are aware that when smoothing a board from the rough as in this test it would be more usual to start with longer and rougher planes than a smooth plane. However for the purposes of this test it was felt that stressing the tools to see how well they plane was important even at the expense of normal efficiency. If you spent less than an hour sharpening the blades then it is no wonder the results were so poor! I can't thank you and your whole team enough for finally putting this seemingly endless question to rest. Rest assured, I'll be recreating your test in my own shop. In the interest of fairness, was the Cherry kiln dried or air dried? Did you control the ambient humidity in the lab? Did you measure the shavings with dial calipers? What was the specific gravity of the liquids used from the pub? I hope you'll conduct future tests. I'm particularly interested in a real and honest test of hand cut vs. machine cut dovetails. Finally showing that a dovetail saw and a router are not really equal. Happy Thanksgiving to you, your family and associates, especially those trusted high enough to be part of this insightful test. Great way to begun my Pre-Thanksgiving Wednesday. Look for my blog featuring a test of roasting our large, happy turkey featuring the rigorous procedures you and your team followed. Now, off to the local pub for more testing. Awesome! Finally someone cuts through the hype and exposes the truth about planes. My question, though, is will they still cut a tomato? Clearly from this test, the Norris is a worthless plane that you should send to me for the cost of shipping. That way, i could copy it accurately and see if the problem is age and not form. I think a newly made version with dovetail sides would go on its own! The only thing a plane can do, no matter how well tuned, is to follow the basic laws of physics. Specifically: gravity works, and objects at rest tend to stay at rest. The test may have yielded different results by using an actuator. With these types of equipment tests, the actuator is usually a biomechanical device known as a "human." This, however, changes the test as it becomes dependent on the quality of the "human" used as an actuator. Some are good value, others quite poor. It may, however, be simpler to redefine what is actually being tested. Experimenters need to do this all the time, as what they initially set out to test becomes moot. Thus, "which plane is better" becomes a much more valuable "which is the better brew carried by our local pub?" With imagination, one can always find value in even the worst failure. I appreciate the lengths you'll go to - at your own expense - in order to provide clear and up to date woodworking information for us. Aha I knew it. Those bevel down bench planes are worthless! This whole exercise just goes to prove that you should always use a bevel up plane. A bevel up plane would have done a much, much better job. And you never ever have to sharpen them. Brought a smile and a chuckle to my otherwise dull day! This was a doomed experiment from the start. You lock up an elite Brit and a poor Indian in the same room, and you are bound to get a stalemate. The Brit will of course decide he is above manual labor, and expect the Indian to do all the work. Nothing in the shop was damaged, was it? The Indian, naturally, decided to protest his subjugation by the Brit and practiced a nonviolent work stoppage. At least we now understand the secret life of bench planes. I've had just the same trouble testing the sharpness of my axe. I have even left it on the chopping block overnight on occasions with plenty of logs lying about ready to be chopped, only to return in the morning to find the axe exactly where I left it, with no kindling produced. Please note the chopping block is in the central part of my shelter and just about proof from the incursions of the elements so I don't think the British weather had anything to do with the result. May it be that tools are shy of being reported on, a bit like our royal celebs and go to ground when they feel alone and in danger of featuring in a trial report? Before buying tools such as this it is really a must to read about reviews of products in order to come up with a very very good decision. There are so many tools or products being offered in the market and sometimes most are misleading. The definitive argument in the plane wars!! !